The University of Northern Illinois unveiled plans for a complete overhaul of its athletic facilities. The $138 million, privately-funded effort will include renovations to Huskie Stadium as well as a new baseball field, new tennis courts and a new indoor Olympic sports facility. Syracuse announced it has no plans to schedule neutral site games at New Jersey’s MetLife Stadium after 2016. Indiana confirmed plans to enclose Memorial Stadium’s south end zone. The new end zone will allow for locker room expansion and will include a cafeteria. Kentucky unveiled plans for a $45 million football training facility. The facility will house dining facilities, strength & conditioning areas, players’ lounge and new locker room. 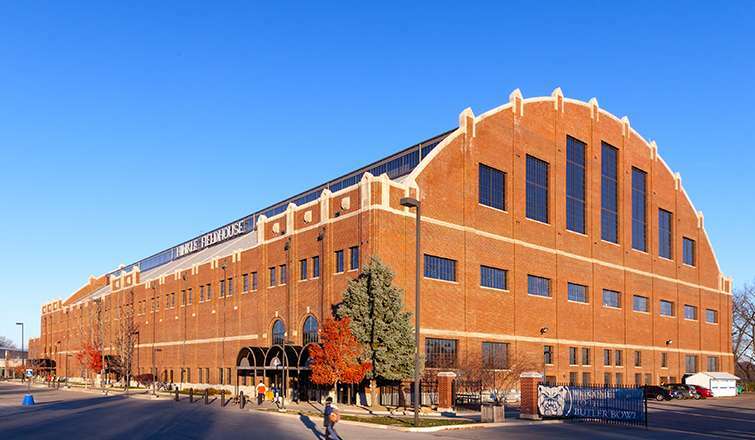 Butler spent $36 million to renovate historic Hinkle Fieldhouse. 4,500 new chair-back seats, a video scoreboard, additional restrooms, and wider concourses address fan comfort and engagement. For the men’s and women’s basketball teams the facility includes new locker rooms, training areas, classroom and meeting space and a larger weight room. Texas will demolish the Frank Erwin Center to make room for a new medical school on campus. A new arena is expected to cost up to $500 million. With renovations to its Alumni Recreation Center expected to cost between $17 million and $21 million, Sienna is exploring separating the renovations into four or five phases in order to make the project more manageable and affordable. The ARC serves as the men’s basketball practice facility and homecourt for the women’s basketball program. Missouri announced a multi-million dollar renovation for Mizzou Arena. The project includes a new video board and upgrades to the team lounge, locker room and strength & conditioning facility. Depaul’s new arena remains on track for completion by the 2016-2017 basketball season. The school is contributing $70 million towards the 10,000 seat arena. Depaul will be moving its games from the northern Chicago suburbs to the near south side, adjacent to McCormick Place. South Dakota has started ground work for a new $66 million, 173,000-sqaure-foot arena. The complex will include 6,000 seat capacity, two practice courts, a weight room and a sports medicine training area. Connecticut dedicated its new Basketball Champions Center, a new $40 million basketball training facility. The 75,000-plus square-foot building includes complete facilities for both the mens’ and womens’ basketball programs. Middle Tennessee State invested $12.64 million to renovate the Murphy Center. In addition to a new roof bathrooms, concession areas, and the building’s HVAC system were all overhauled. Michigan State announced privately-funded renovation plans for the Munn Ice Arena to include HD video boards and LED ribbon boards. Completion is expected within the next 12 months. TCU dedicated its new G. Malcolm Louden Player Development Center for Baseball, featuring a new hitting facility and turf practice area. 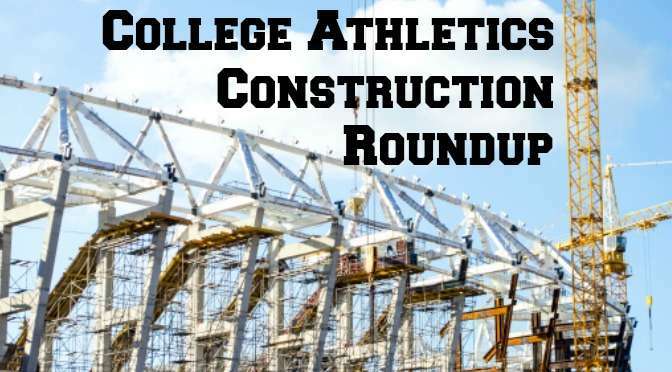 Baylor’s $18.1 million track and field facility is nearing completion and is expected to be ready for the 2015 outdoor season. The facility includes an indoor practice facility, training room, meeting rooms and coaches’ offices. Canisius hockey is moving to the new downtown Buffalo HARBORcenter, which is attached to the First Niagara Center (home to the NHL’s Buffalo Sabres). HARBORcenter will have two NHL-sized rinks, one with 1,800 seats for Canisius home games, and a 1,300 square foot locker room for use by the Griffs. Eastern Michigan announced it will spend $115,000 to renovate Scicluna Field. The project will include a press box, camera platforms, and permanent bleachers. Kent State dedicated a new baseball and softball training facility. The facility features dirt pitching mounds and moveable batting cages, in addition to coaches’ office space. Alabama opened a new boathouse and student activity center for the rowing program. The boathouse is large enough to house 54 shells while the student activity center includes locker rooms, athletic training areas, and coaches’ offices. Cornell will install new LED lighting systems in 10 indoor sports venues. Among the facilities to receive the new lighting are the Friedman Wrestling Center, Barton Hall (track), James Lynah Rink (hockey) and the Oxley Equestrian Center. Georgia’s $12 million upgrades to Foley Field remain on schedule for completion in time for the 2015 baseball season. The upgrades ensure ADA compliance, increase the size of the press box and add premium level seating. South Dakota State opened its new 149,284 indoor athletic complex. The facility features an eight-lane, 300-meter track and 80-yard turf field. UT Pan American completed phase one and opened a new soccer, track and field complex. Phase two will include a press box, more lighting and bleachers, a practice field, and a field house. DePauw formally dedicated Reavis Stadium, a new facility that will host soccer, field hockey and lacrosse. The facility includes two synthetic fields (one for practices) and 750-seat capacity. 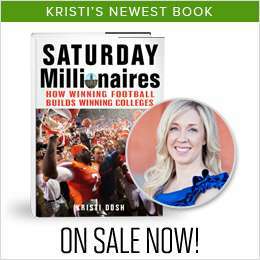 FBS football programs have recently completed, are currently undertaking or are planning $3.6 billion in stadium renovations. CBS examines how these renovations are impacting capacity, with some programs adding seats and others downsizing overall capacity while adding more premium seating. Georgia Tech has begun accepting bitcoin for concession purchases at Bobby Dodd Stadium and McCamish Pavilion. Addressing fan experience challenges with concession lines, Colorado added 18 points of sale (bringing the total number to over 100) and 34 mobile vendors to football home games. Are you working on a project we should include next month? Please send any relevant details, links and images to us by email. Several projects to add to your list! Penn State Intramural Building Renovation; University of Arizona McKale Arena Renovation; University of South Dakota Sports Performance Enhancement Complex; and the Kansas State University Vanier Football Complex. Texas A&M has just announced in the Battalion, the student newspaper, that the implosion of the west side of Kyle Field will take place on the morning of December 21.